LAHORE, Aug 13 (APP): Adviser to Prime Minister on National History and Literary Heritage, Irfan Siddiqui said on Saturday said Pakistan had achieved several goals of progress during the tenure of incumbent government. 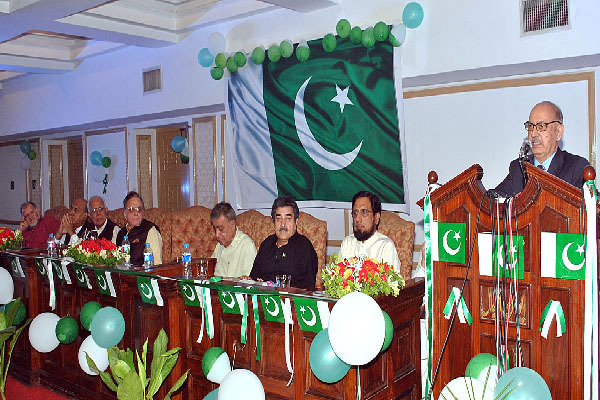 Addressing a seminar to mark the 70th Independence Day held here at Aiwan-e-Iqbal, he said that hope and faith were the keys to success, adding there was a dire need to give faith and hope of future to youth of the country. He said Pakistan had become a state in the light of the sayings of Quaid-e-Azam Muhammad Ali Jinnah and there was no doubt in it that Pakistan was created to have a place for the Muslims of sub-continent where they could practise their religion. He said that it was unfortunate that 35 precious years of 70 years, were ruined by martial laws but now democratic process was prevailing which was a basis of prosperity. Irfan said that Pakistan had great potential for success but the nation had to work hard for progress. He said foreign reserves were all time high, which were just US$ 8 to 9 billion in 2013 when the PML-N took over the charge. He urged the opponents of the government to accept and respect the power of vote and right of the nation, which voted for current government. In his address, former minister for foreign affairs Khursheed Ahmad Kasuri said that Pakistan was making progress in all sectors of life. On Kashmir issue, he said that India would not be able to hold the present position in Occupied Kashmir as Kashmiris’ rights could not be usurped by resorting to atrocities. Several other intellectuals including Arif Nizami, Oriya Maqbool Jan, Iftekhar Ahmad, Arshad Ahmad Arif and Sajjad Mir also spoke on the occasion.